To use Object Storage you must be registered as a customer for Interoute Virtual Data Centre (VDC). However there is no commitment or charges to make use of VDC services in order to access Object Storage. Your use of Object Storage (or VDC) will be entirely billed on a pay-as-you-go basis. If you are already an Interoute VDC customer then you can start to use Object Storage immediately. With your VDC login details, you can access the My Services portal to begin using Object Storage. See this video for guidance: https://cloudstore.interoute.com/resource-centre/videos/overview-vdc-myservices-cloudstore . The graphical user interface for Object Storage is accessed via the Interoute 'My Services' web portal. 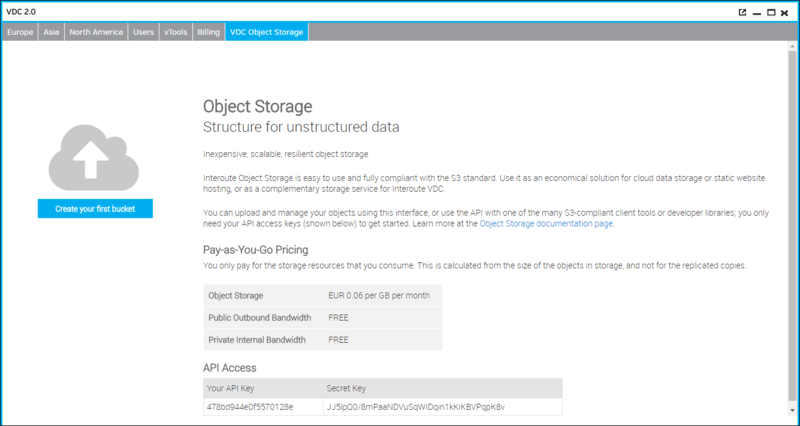 For API-based access to Object Storage see the Object Storage API User Guide. Click on Products in the top menu and select VDC 2.0. If you need help with Object Storage there are two buttons available on the main screen (see below). The Help button will take you to the documentation for Object Storage (including this document), and the liveChat button which will connect you to the Interoute support team for immediate interactive help (available Monday to Friday daytimes). In Object Storage, files are stored as 'objects'. Every object must be contained in a 'bucket'. Bucket names are unique for all users, that is, you cannot use a bucket name that any other user has already used. Buckets can be sub-divided through the use of 'folders'. There is a limit of 100 buckets per account and an unlimited number of objects per bucket. Included at the bottom are the 'API keys' that you will need to access Object Storage via the API. You can find these keys at any time later using the Api Access button on the main screen of Object Storage. Enter a Bucket Name, the Object Storage Region where bucket content will be stored, and the Storage Policy. Click Save to finish the bucket creation. All object data are triple-replicated with a choice of storage policies. Use a '1+1+1' (triple data centre) storage policy for maximal resilience: data will remain writable in case of an outage at any one data centre, and readable in case of simultaneous outage at two data centres. The '2+1' (dual data centre) policies are recommended if you require 'sovereign' data storage where data are guaranteed to remain stored within the borders of a single country; this is currently available for the United Kingdom (EU region), Germany (DE region) and Switzerland (CH region). Charges for Object Storage are based only on the size of the stored object and the multiple copies are inclusive to the per GB charge (per hour of use). Note the Help button which will take you to the documentation for Object Storage, and the liveChat button which will connect you to the support team for immediate interactive help (available Monday to Friday daytimes). Choose files from your local file system by clicking Select Files. You can select multiple files by the usual method for your operating system, such as 'Control-click'. Tick the Store encrypted box if you want the new objects to be stored in encrypted form. Click the Upload button to perform the upload to Object Storage. Click Save to create the folder. You can create folders inside folders to further organise your objects. For uploading using the user interface: multipart uploads are applied automatically (based on a fixed 10 MB part-upload size). The user interface can upload objects with a maximum size of 96 GB. For uploading using the API (including using a client tool): the maximum allowed PUT size (that is, for one API call) is 10 GB. Using a multipart upload, the platform allows a maximum of 10,000 part-uploads. Note that client tools may impose a 'single PUT' limit that is smaller than 10 GB. Multipart uploads are recommended for objects greater than 100 MB in size. See the Object Storage API User Guide for more information. Interoute recommends that the size of a single stored object should not exceed 5 TB. Please contact Interoute Support for technical advice on storing very large objects in Interoute Object Storage. Click a bucket Name to view the objects and folders that it contains. Bucket names are unique for all users, that is, you cannot use a name that any other user has already used. Enter the Bucket Name (a unique name is required). Select the Region (drop-down showing available regions). 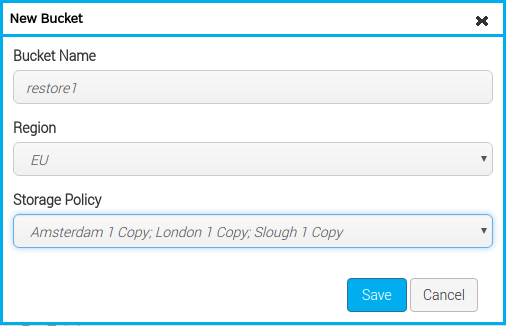 Select the Storage Policy (drop-down showing available storage policies). Click Save to create the bucket. For the purpose of uploading and managing buckets and objects using the API, you should use the endpoint for the region where the bucket is located. For more information, see the Object Storage API User Guide. For object shares and static websites set up using the user interface, the required endpoint will always be given in the URL that is output. The storage policy applies to every object in a bucket and is fixed at the point of creation of the bucket. The policy determines how an object is replicated in the data centres of an Object Storage region. Note: charges for Object Storage are based only on the size of the stored object and the multiple copies are inclusive to the per GB charge (per hour of use). Use a '1+1+1' (triple data centre) storage policy for maximal resilience: data will remain writable in case of an outage at any one data centre, and readable in case of simultaneous outage at two data centres. '1+1+1' is currently available in the EU region. The '2+1' (dual data centre) policies are recommended if you require 'sovereign' data storage where data are guaranteed to remain stored within the borders of a single country; this is currently available for the United Kingdom (EU region), Germany (DE region) and Switzerland (CH region). Note: it is not currently possible in the graphical user interface to view the storage policy for a bucket. This can be checked using the API. 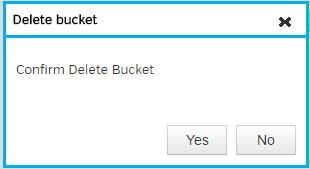 Click the Delete bucket button (dustbin icon). You will be prompted to confirm the bucket deletion. The deletion cannot be undone. Deletions cannot be undone and there is no recovery service for items that you delete in Object Storage. The set of permissions for a bucket determines the users who can access the bucket, and whether each user can Read or Write bucket contents, and Change the set of permissions. To access the permissions, click the bucket's Edit button, and select the Permissions tab. 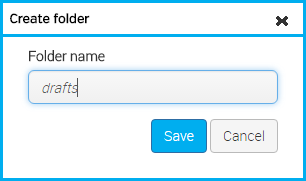 Select a User from the set of users who have access to the Interoute account in use, and use the tick boxes to allow that user to Read or Write objects and folders in the bucket, or 'Allow user to change permissions'. Click Save to save the new permission. If you are an owner of a bucket, you will be able to click on the Edit button for a Permission, and modify or remove it (that is, untick all of the permission types). To return to the List of Buckets, click '←Back to Buckets' at the top of the interface. If you click the name of an object, the object will be downloaded into your web browser. Your browser settings determine whether the object will be opened and displayed within the browser, or saved to your local disk. If you click the name of a folder, you will see only the contents of the folder (objects or folders). Thus you can organise objects by creating folders within folders, etc. You can use the 'path' breadcrumbs display at the top of the window to go back to the bucket contents view, or Back to Buckets. Tick the Store encrypted box if you want the new object(s) to be stored in encrypted form. 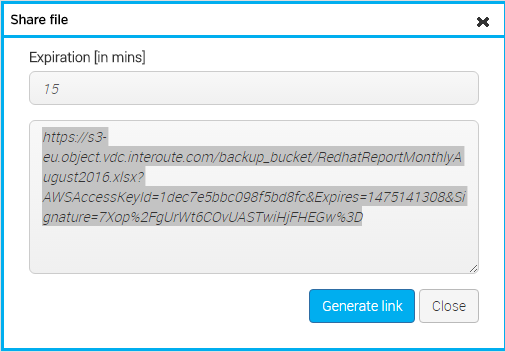 Click the Upload button to perform the upload to Object Storage. If an object of the same name already exists inside the bucket/folder, a newly-uploaded object will replace the existing one. The Object Storage platform does support 'versioning' of objects (where an object of the same name can be stored in multiple versions), but this is not supported by the user interface. You need to use the API to access versioning functions: for more information see the Object Storage API User Guide. Go to the bucket or folder where you want a new folder to be located. Click the Create New Folder button and enter the Folder name. 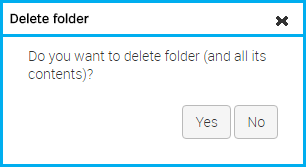 Click Save to create the folder. Click the Delete button (dustbin icon). There is no recovery service for items that you delete in Object Storage. 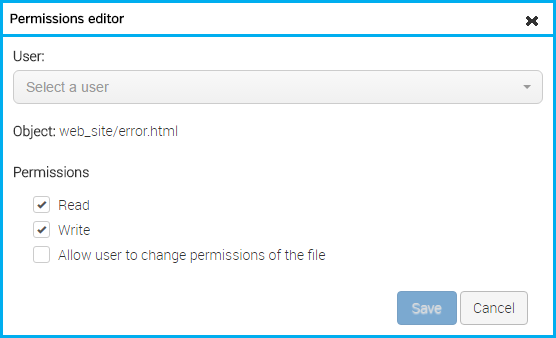 The set of permissions for a object or folder determines the users who can access the item, and whether each user can Read or Write to the object or folder, and Change the set of permissions. To access the permissions, click the Edit button, and select the Permissions tab. Select a User from the set of users who have access to the Interoute account in use, and use the tick boxes to allow that user to Read or Write the object/folder, or 'Allow user to change permissions'. Click Save to save the new permission. If you are an owner of an item, you will be able to click on the Edit button for a Permission, and modify or remove it (that is, untick all of the permission types). You can add key-value metadata to any object or folder (where you have a permission to modify it). Use the Edit button to modify the key or value. Use the Delete button to remove the key-value pair. Objects can be made publicly-accessible by using the Share function, which generates a URL that can be used by anyone. You decide the amount of time (in minutes) for which the URL will be active. After this time, access will be removed and the URL will return an 'expired' error. If you need to share a set of objects it may be easier to use the Static Website hosting function (see below). Type in the expiration time (the number of minutes that the share link will be active). This URL can be used to access the object from any location on the Internet. The Object Storage API is fully compatible with the Amazon S3 standard. This means that you can connect to Object Storage using any client program or programming library that is based on that standard. Buckets created using the API will not be correctly visible in the GUI, until you do a 'put bucket CORS' API call for the bucket. This is explained at https://github.com/Interoute/object-storage-api. There are numerous open source and proprietary client programs available which will connect Object Storage with your computer operating system as a 'storage device' for different purposes, such as a networked drive or a remote backup device. To begin using the API, you simply need the 'API keys' that are assigned to your Object Storage account. These can be found by clicking the button Api Access in the List of Buckets view. Most S3-based client tools require a configuration file containing the API keys and information about the host server. For more information and example files, see https://github.com/Interoute/object-storage-api . 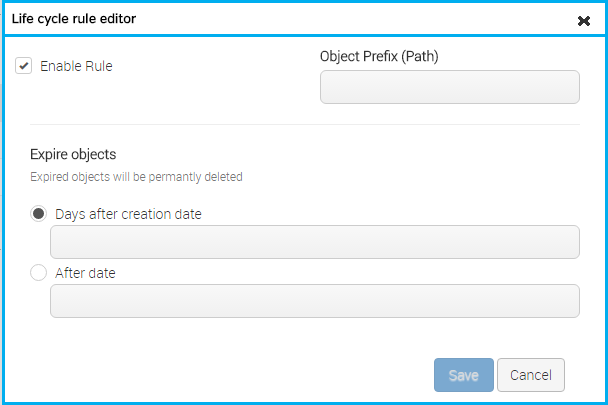 You can configure an object to automatically delete itself at a specified future date, or a number of days from the date that the object is created. These are called life cycle rules. 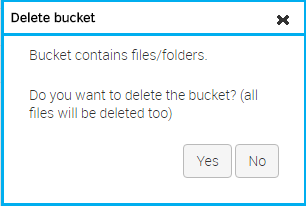 You can set a rule for a bucket (or a folder) so that all of the objects in the bucket (or folder) will adopt that rule. A common use case for life cycle rules is when you need to store log files or business transaction records for a fixed period of time. Note that Object Storage has no recovery service for deleted objects. 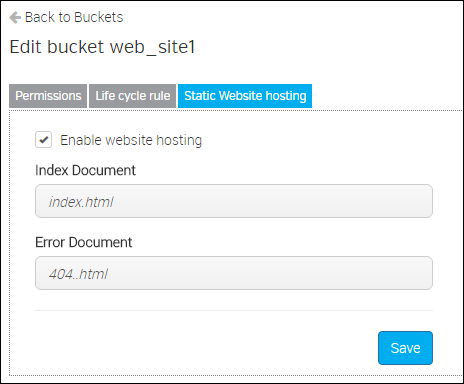 To create a life cycle rule for an entire bucket, click the Edit button for the bucket, and click the Life cycle rule tab. Choose either Days after creation date or After date. In the latter case a calendar widget will be displayed to set a date. Note that it uses US-style date format month/date/year. Click Save to create the rule for the bucket. into the box, with a trailing '/'. You do not type the bucket name as part of the path. Rules cannot overlap: thus if you create a rule for an entire bucket, you can't have different rules for any folders or objects inside the bucket. And you can't have a rule for a folder, with a different rule for an object inside the folder. A rule can be modified at any time by clicking the Edit button for the rule. You can suspend the application of the rule by unticking the Enable Rule tick box. To permanently remove a life cycle rule, click its Delete button. Any bucket can be enabled so that its contents are available on the Internet as a static website (that is, the content consists of a fixed set of files, and there is no 'server side' processing to generate content). Note: websites are HTTP only, secure HTTP is not currently available. You will have to create the HTML pages (and CSS definitions, etc.) necessary for your files to be linked together and appear as a formatted website, in the same way as you would do for a website that is being hosted by an Internet servicer provider. When 'Static Website hosting' is enabled, all of the objects contained in a bucket will be accessible via the Internet, therefore you should not have any objects in the bucket that you do not wish to be exposed to public access. Tick Enable website hosting to make the bucket contents accessible as a website. You can untick this at any time to make the website 'offline'. In the Index Document box, enter the name of the object whose HTML content will appear when someone uses the website name as the URL without any content path specified. This is also known as the 'home page' or 'start page'. In the Error Document box, enter the name of the object whose HTML content will appear when someone tries to access a page in the website that does not exist, which is also known as a '404 error'. This page should provide a link to the Index page, and it may have a contact link (such as an email address) to report the error. It is not necessary to add a trailing '/' to the URL. There is no default Index page, and no checking that the Index and Error objects are present in the bucket. It is your responsibility to upload these objects, and to provide all of the website content.